In anticipation for Thanksgiving later this month I'm immersing myself in US culture by doing what I do best: watching repeats of Buffy and making tasty snacks to share with my family. And who doesn't like cheese dip? Except for my friend Sarah who avoids cheese like the plague, but then she makes up for it by eating copious amounts of cake so balance is restored. I love nacho cheese flavoured ANYTHING and I've been on a hunt for some spicy dip to eat with nachos and this recipe ticks all of the boxes. I used mexicana cheese to give it a peppery kick and the only thing I'd do differently is to add the full can of evaporated milk as the cheese dip seemed to solidify as it cooled and the additional milk might have prevented this. It's such a simple recipe to follow and it literally took about 5mins to make which was a bonus. Add cheese and cornflour to large bowl. Toss to combine. Transfer to medium saucepan. 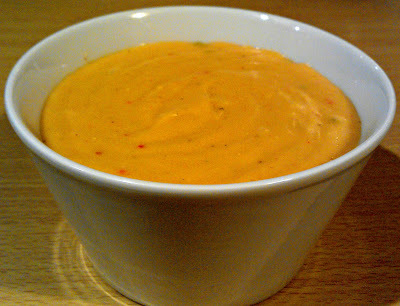 Add 1 cup evaporated milk and hot sauce. Cook over low heat, stirring constantly with whisk until melted, bubbly, and thickened (about 5 minutes). Mixture will look thin and grainy at first but will thicken and come together after heating. Thin to desired consistency with additional evaporated milk.